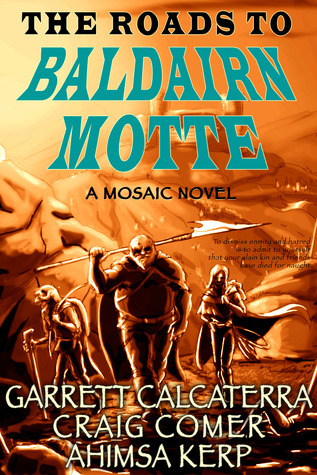 For a heroic fantasy novel written by not one, not two, but three authors - Garrett Calcaterra, Craig Comer, and Ahimsa Kerp - The Roads to Baldairn Motte is a surprisingly well-structured, remarkably cohesive tale that actually benefits from the different voices, without seeming fragmented. It's worth noting that this is a second edition of the tale, with new content, and a massive restructuring. I can't speak for the original edition, but my impression, based on this, is that restructuring paid off. What we have here are three overlapping stories, each with a different narrative lead, but tied together by the same world, the same war, and the same struggles for survival. Interestingly, it's less about the war itself and those with the greatest stakes, and more about the 'common' people who are swept up by it, drawn into it, and (in some cases) ultimately defined by it. Yes, there are kings, princes, emperors, lords and noblemen here, some of who are central to the tale, but it's the whores, farmers, peasants, doctors, soldiers, and other 'common' people with whom we're invited to connect. There are, of course, characters who cross over between tales, and I surprised to find that they retained a consistent feel, despite being written by different authors. Clearly, a great deal of thought and planning went into shaping this 'mosaic' novel, and it shows. I felt the writing was a bit rushed or abrupt in places, as if the authors were impatient to get on with the story, but not to the point where it took away from the experience. The world was well-established in terms of politics and geography, with the stakes of war made quite clear. Some scenes could have benefited from a bit more physical description, just to anchor the reader in the world, but that's a minor quibble. Overall, the dialogue was strong, and the writing showed some definite flair. The Roads to Baldairn Motte is an interesting tale, both in terms of structure and content, and definitely worth a read. Great review as always. I have this one on my reading list, can't wait to give it a try now.